The history of Karcinoma has begun at 1994 when three classmates have decided to play brutal death metal and could record debut album in this genre which was passed in underground of Yaroslavl city. Time has passed and the only guitar player Michail Bukanov has left from the first line-up. That genre has changed as well towards melodic black. The new musicians have come had between them was back vocalistess Yana who take the part of main vocals. 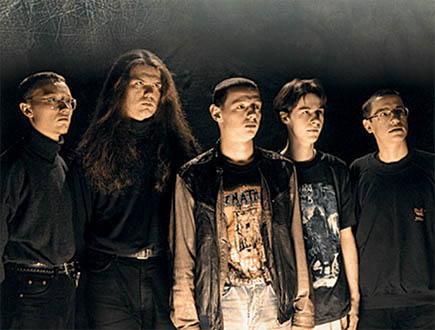 In the autumn of 1997 Karcinoma`s begun the recording of the second album «The Night... Apogee of Madness». The recording was finished in the beginning of 1998. Since the summer of 1998 the band made self-release MC with this album inside Yaroslavl. The reviews were mostly positive and the band was compared with Greek «Septic Flesh». During 1999 and 2000 «Karcinoma» make tours inside Yaroslavl. The vocalist suddenly was imprisoned and up to the end of the band in 2001 only Yana performed vocal parts, and the genre of the band turned from melodic black into gothic power. That` s pity but the band didn`t recordings during this period. In 2007 «Stygian Crypt prod» decides to issue the CD of album of almost ten years old. Despite of venerable age of the recording the material not a bit out of date and you can hear it without taking.